You have a parquet floor, perhaps hidden beneath carpets for years… This pale, worn surface can be restored to life. It’s worth the investment: an equivalent new floor of herringbone or basket weave can cost between £70-120 per sqm. Make sure that each stage is complete before embarking on the next, especially by allowing adequate drying time. And do follow the instructions on each product you use. 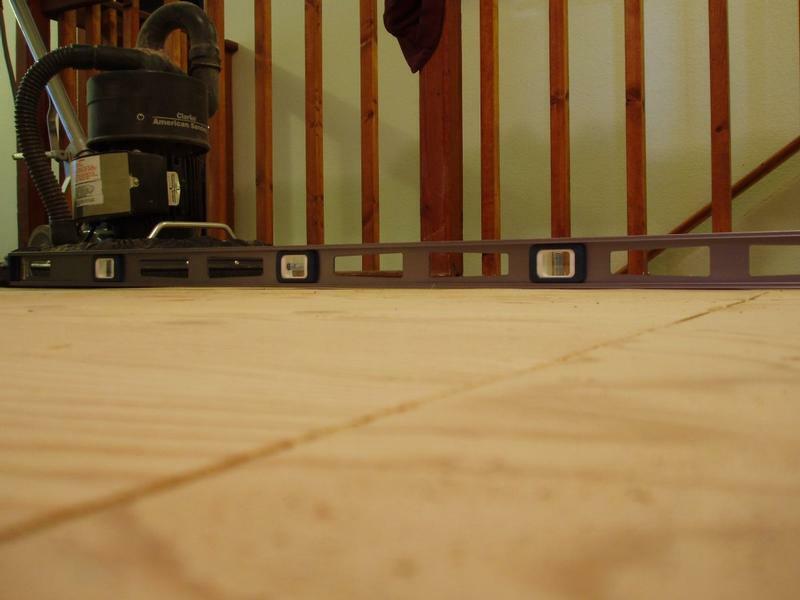 Check the floor for blocks with weak attachments to the subfloor: you will either notice movement or hear a hollow sound on tapping the block. Missing blocks are usually the results of central heating works or other plumbing/building work. Parquet floors produced over the last twenty years have a tongue and grooved sides for the fitting. Removing such loose/damaged blocks needs care to avoid loosening adjacent connecting blocks. You can poach missing blocks from another room - from an area hidden around cupboards or which you do not plan to restore. The reclamation yards are another possibility. Check the size of the existing blocks: many come in the imperial measurements from the period when these floors were popular ie 1930-1970. Also make sure that they are composed of the same type of timber to prevent colour variation between the new and the old floors. 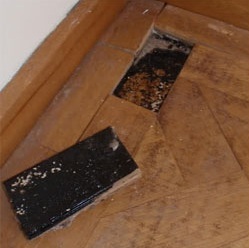 Parquet floors were normally attached with bitumen - a black tar which is no longer a permitted adhesive. All residue of bitumen and subfloor material stuck to the blocks must be removed. If not, the bitumen will affect the bonding time of the modern adhesive you use to reinstall the blocks. From the norm of 6 - 8 hours, this may increase to more than a day. With the blocks removed, the subfloor below may be uneven. Removing the bitumen may also damage the concrete or sheet material. Acrylic levelling compound will level a concrete floor out - 3mm maximum per coat. Even though it is non-water based and dries relatively quickly, allow sufficient drying time before you start replacing the wood blocks. If the blocks vary in height, especially where old meets new - start with G24 paper. 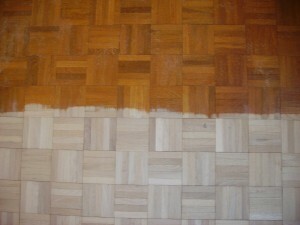 Sanding should be performed with the grain, but herringbone and various other patterns make this impossible. 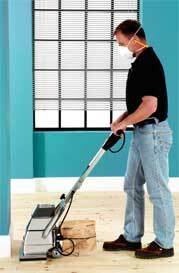 The cumulative effect of the various sandings should produce a satisfactory job. Start from one wall and ‘walk' with the belt-sander across to the opposite side; then walk back sanding the floors over the same area. After doing the last row in this direction, turn 90 degrees and resand the whole room in the same way. Place G40 paper on the edge-sander to tackle the areas the belt-sander couldn't reach. Repeat the area with G80. Make sure you begin sanding with an empty dust bag - you'll need the ‘clean’ dust from this G80 sanding to mix with the wood-filler later. Vacuum the whole floor between each sand. 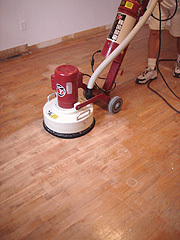 To fill the gaps in your restored floor, mix the collected dust from the second sanding process with resin wood filler. Make a little at a time, as it dries quickly. Fill the larger gaps as best as possible - the excess filler on the wood blocks will be removed by the third sanding round. 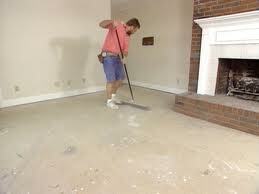 You may care to fill every tiny gap in the entire floor with a thin layer of filler, using a flat trowel. After all gaps are filled, allow the filler to dry out - 30 to 60 minutes depending on the depth of the gaps. G120 sanding paper for the third sanding round will remove the excess wood filler and give your wood floor the smoothest surface, ready for its new finish. Once again, carefully vacuum-clean the whole floor. Hardwax-oil will bring up the natural beauty of your parquet floors in a non-glossy way. The oil will penetrate the wood for long term protection and the wax will create your wear and tear layer, protecting your floor against dirt and drips. Another option is lacquer - in matt, satin or gloss. As it is much more durable than hardwax oil, the finish requires less maintenance, although a polyurethane coat of polish is always recommended. The best brands are Osmo, Bona and Junckers. They are only available in specialised wood flooring suppliers and come in bottles of 5L (lacquer) or 2.5L (oil) - enough for one coat of 50 sqm. Use a G120 screen or G150 fine sanding disk, placed on a slow rotary machine over a white buffing pad. Sand just before the final coat of the lacquer or oil. 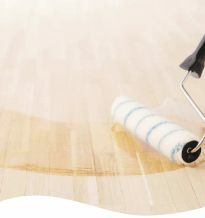 This fine floor sanding will remove the raised surface created by the application and hardening of your finish - allowing your final coat of sealant to bond perfectly to the previous coat. Allow at least 12 hours before you bring back the furniture.